I dream of the Chocolate Lands, tropical countries within 20 degrees north and south of the equator, that provide perfect growing conditions for the cacao trees. Archeological evidence and DNA testing have traced the original cacao trees to Central and South America. Legends of the Mayan people credit Quatzequatel, one of their gods, for smuggling the cacao seeds from heaven to earth and teaching their people the complex preparation of a chocolate drink, chocolatl. The seeds were used for currency and purportedly fueled warriors to run many miles. 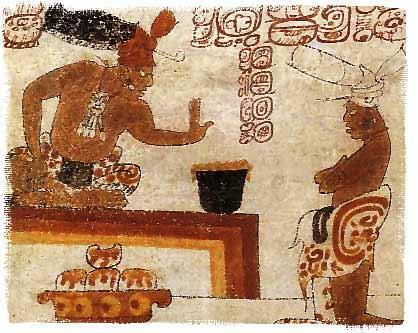 The Aztecs subdued the Mayans and demanded cacao beans as tribute. When Spain encountered the Aztec people, they brought cacao back to their country, but kept it secret, reserved only for the Spanish elite. Chocolate finally became a more widespread drink for the common people after nearly 100 years through Spanish princesses married off to other countries: the secret was out. English chocolate houses soon rivaled coffee and tea houses in popularity and eventually migrated to America with the new settlers. The first chocolate bar wasn’t invented until 1847. Today demand for chocolate supports cacao plantations in those chocolate latitudes around the globe. Chocolate, once reserved for kings and noblemen, is now available to us in a range of prices. The best chocolate, though, is worth paying a premium for as an edible experience and affordable luxury. Every bite of artisanal chocolate transports me to its birthplace. Single-origin -- meaning a harvest of beans from one location -- dark chocolate can be tasted and enjoyed much like varieties of wine and uses similar language to discuss the experience. Each country, even the individual cacao farm, imprints its unique flavor, or “terroir,” providing the taster with subtle (and sometimes startling) variations and flavor notes. Chocolatiers, who purchase the fermented and dried cacao beans from the farmers, further enhance the beans with their methods of roasting and grinding the beans, then conching, and tempering the chocolate. The most interesting bars are composed simply of cocoa beans and sugar. Dandelion Chocolate in San Francisco has Madagascar chocolate bars with flavors of red berry and mango. A Venezuelan chocolate bar from Cru Chocolate in Sacramento lingers on the tongue: fudgy nuts and tannins. Amano Chocolate from Utah makes a fascinating bar called Dos Rios that carries complex flavors of orange that morphs into herbaceous lavender. The Dos Rios bar sings when paired with a robust Sangiovese wine. Even milk chocolate has a new life beyond Hershey bars and s’mores with Tcho chocolate company's use of these superior cacao beans, giving milk-chocolate lovers a renaissance of creamy caramel flavors. Are you ready to begin your own chocolate adventure? The next time you sample a fine, single-origin chocolate bar, take your time. Notice the surface of the bar, shiny or dull, and any special decorative elements. Break it in half and listen for the snap, then sniff it to pick up any cocoa essence released by the break and your warm fingers. Place the chocolate on your tongue and allow it to melt slowly, chewing only a few times. Notice any flavors you pick up immediately and if they change over the course of the melt. How long does the flavor linger in your mouth after the chocolate is gone and do any new flavors bloom? Each morsel you savor contains the long history of cacao, the earth it grew in, the farmer that harvested and prepared the beans, and the skill and expertise of the chocolatier that made the bar. You can track your experiences on the forms sent with each delivery. Cocoa Case deliveries curated chocolate directly to your door to help you enjoy the luxurious experience whenever you like!